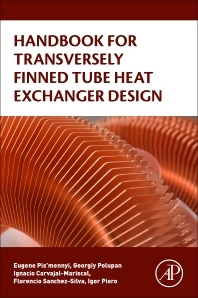 Handbook for Transversely Finned Tubes Heat Exchangers Design contains detailed experimental data, correlations, and design methods for designing and improving the performance of finned tube heat exchangers. It covers the three main types, circular finned, square finned, and helical finned tube bundles. Based on extensive experimental studies and tested at leading design and research institutions, this handbook provides an extensive set of materials for calculating and designing convective surfaces from transversely finned tubes, with a particular emphasis on power plant applications. Eugene Pis’mennyi graduated as a mechanical engineer within the area of steamgenerator design from the National Technical University of Ukraine, Kyiv Polytechnic Institute. He obtained his Ph.D. within the area of thermal physics at the same institution. Dr. Pis’mennyi earned a degree of Doctor of Technical Sciences from the Institute of Engineering Thermophysics, National Academy of Sciences of Ukraine. Dr. Pis’mennyi is an internationally recognized scientist within the areas of nuclear engineering and heat transfer. He is an author of more than 400 publications, including eight technical books, 16 patents, and more than 50 technical reports. He has supervised 15 Ph.D. and more than 100 master in science and bachelor’s theses. Currently, Dr. Pis’mennyi is a dean of the Heat Power Engineering Faculty and the Chief of Nuclear Power Plants and Engineering Thermophysics Department at the National Technical University of Ukraine, Kyiv Polytechnic Institute. Georgiy Polupan graduated as a mechanical engineer within the area of steam generator design from the National Technical University of Ukraine, Kyiv Polytechnic Institute. He obtained his Ph.D. within the area of thermal physics at the same institution. His major area of study is thermal processes in steam generators, thermo physics, and efficient use of energy. He is an author of more than 300 publications, including three technical books, two patents, and 67 papers in refereed journals. G. Polupan was a researcher at the Thermal Physics Department from 1972 to 1985 and a professor of the Thermal Engineering Faculty of the National Technical University of Ukraine, Kyiv Polytechnic Institute from 1985 to 1999. Since 1999, he has been a full professor at the National Polytechnic Institute of Mexico, Superior School of Mechanical and Electrical Engineering, Thermal Engineering and Applied Hydraulic Laboratory. Ignacio Carvajal-Mariscal graduated as a Mechanical Engineer from the Moscow Power Engineering Institute (Russia) in 1994. He possessed M.Sc. and Ph.D. in Thermal Engineering from the same institution in 1996 and 1999, respectively. He was a Visiting Professor at the Mechanical and Mechatronics Engineering Department, University of Waterloo, Waterloo, Canada, in 2008-2009. His major area of study is convective heat transfer. He is an author of more de 200 publications including 1 technical books, 23 papers in refereed journals. Currently, Dr. Carvajal-Mariscal is a full professor at the National Polytechnic Institute of Mexico. His research interests are heat-transfer enhancement, experimental fluid dynamics and heat-exchanger design. Dr. Carvajal-Mariscal is an ASME member since 2008. Florencio Sanchez-Silva graduated as a Mechanical Engineer from the National Polytechnic Institute of Mexico, Mexico City, in 1974. He possessed M.Sc. in Thermodynamics and Ph.D. in Thermal Engineering from the National Superior School of Mechanics and Aerothermics of Poitiers - France, in l980. He was a post doctorate in two-phase flow dynamics at the University of Pisa, Italy, in 1988-1989 and spent his sabbatical leave at the Texas A&M University in 2000-2001. His major area of study is two-phase flow dynamics and phase change heat transfer. Currently, he is a full professor at the National Polytechnic Institute of Mexico. His research interests are two-phase flow dynamics, heat pipes, energy saving and, development and analysis of thermal energy systems. Up to now, Dr. Sánchez-Silva has 38 refereed journal publications, 250 refereed papers in conference proceedings, 15 technical reports, 2 technical books, 3 chapters in technical books. He has supervised 3 PhD, 44 Master in Science and 31 bachelor thesis on two-phase flow, heat transfer, fluid mechanics, metrology and thermal systems topics. Dr. Sanchez-Silva is a Fellow of the Societé des Ingenieurs et Scientifiques de France, Mexican Section (since l987) and a member of the Mexican Academy of Sciences since 2004. Professor Igor Pioro is an internationally recognized scientist within areas of nuclear engineering. He is author/co-author of 367 publications including 9 technical books, 15 chapters in technical books, 76 papers in refereed journals, 198 papers in refereed proceedings of international and national conferences and symposiums, 26 patents and inventions, and 43 major technical reports. Professor Pioro graduated from the National Technical University of Ukraine/Kiev Polytechnic Institute with Master of Applied Science in Thermal Physics in 1979. After that, he worked in various positions, including an engineer, senior scientist, deputy director, professor, director of the graduate program in nuclear engineering, and associate dean. Currently, he is associated with the Faculty of Energy Systems and Nuclear Science University of Ontario Institute of Technology (Canada). Professor Pioro is a Founding Editor of the ASME Journal of Nuclear Engineering and Radiation Science (from 2014) and an Associate Editor of the ASME Journal of Engineering for Gas Turbines & Power. He was a Chair of the Executive Committee of the Nuclear Engineering Division of the ASME (2011-2012) and a Chair of the International Conference On Nuclear Engineering (ICONE20-POWER2012). Professor Pioro has received many international and national awards and certificates of appreciation including an Honorary Doctor’s degree from the National Technical University of Ukraine “Kiev Polytechnic Institute” (2013); The Canadian Nuclear Society (CNS) Education and Communication Award (2011); The UOIT Research Excellence Award (2011); and the ICONE Award from the American Society of Mechanical Engineers (ASME) (2009).